If there is one thing that I learned from thru-hiking the Appalachian Trail, it’s take less. I’d rather be underprepared than overpacked. Underprepared often results in temporary discomfort while overpacked is a constant pain in the back, literally. I learned that the hard way. After starting the Appalachian Trail with a 50 pound pack I found this gem of wisdom in a Backpacker Magazine. When I returned from my backpacking trip there was only one thing that I wished I’d taken. Less. While I’m not in South America for hiking, camping, and pooping in the woods (although a variation of this things may happen on occasion), I have been toting around all of my belongings in a backpack on a regular basis. One thing is for sure, a smaller, lighter pack is key when taking public buses, taxis, and walking around in circles trying to find my hostel. Before leaving home I spent countless hours thinking about what I’d need in my pack to be able to live on the road long term and came up with my final answer. Not Much. Other than carrying a few basics, everything I could possibly need would already be in my destination. People had been living there for generations, so if I forgot anything, I could just go buy it. Before hiking the Appalachian Trail I had owned no backpacking gear. I spent in excess of $2,000 purchasing the latest and greatest camping equipment recommended by my local outfitter, only to send half of it home unused. I wasn’t going to make the same mistake again. You can find a plethora of blogs about world travel packing lists, and I’ll admit that I read many and salivated over the incredible travel gear. In the end though, I left home with only items that I already owned. Here’s a quick video showing everything I own for my Digital Nomad adventures in South America. Everything fits into one pack, but when traveling I use my main backpack for replaceable items because it gets stowed under the bus, and my daypack for more important items including my laptop, camera, passport, money, and beer koozie. Priorities. Backpack – ULA Catalyst – Bigger pack than I need, most of the time it’s not even full, but I already owned it. Score! Daypack – GoLite Rush 14 Liter – My laptop goes in here, great for around town or for my valuables while taking public transportation and my larger pack is stored under the bus. Running Pack – Ultimate Direction Wasp – This was a “luxury” item and I considered not bringing it, but running is one thing I do religiously, and exploring a new city on foot is the best way to get around. I have used this more than my floss, but don’t tell my dentist! Dry Bags – Sea To Summit Ultra-Sil Dry Sacks – Sometimes it rains, and if you’re walking with your house on your back, everything gets wet. I carry 3 dry bags for clothes, electronics, and anything I don’t want to get wet, which is pretty much everything. Dry Bags – aLOKSAK – Extra waterproof protection for my electronics. Backpack Rain Cover – Sea To Summit – Because I really don’t want my house to get wet. I tried to keep them to a minimum, mostly because the charging cables and accessories add up quick! But alas, clunky items like my laptop are paying for my lifestyle, so they are a necessity. Laptop Computer – 15″ Brick – Not the most travel friendly laptop, but free! eReader – Kindle – I can check out books from the library in the United States. DSLR Camera – Canon Rebel T5 – Cause I like taking pictures! Waterproof Camera – Panasonic Lumix – Cause I like taking pictures in the rain! GoPro – Hero3 – Cause why not!? Phone – Samsung Galaxy S3 – Old phone, for WiFi only. External Hard Drive – WD Elements – To back up work files and personal photos, everything is backed up on DropBox too. External Charger – Jackery Giant+ – To charge my phone on long bus trips. Various – Headphones, extra batteries, charging cables. I didn’t buy anything new for this trip, I left with only items I already owned. If I could change anything I’d buy 2 more pair of ExOfficio underwear, otherwise I’m pretty set! Button Up Shirt – 1, in case I need to class it up a bit. Buff – 2 buffs, similar to bandanas, mostly use to wrap my electronics in. Fleece Pullover – Mountain Hardware – Great for chilly nights. Wind Breaker – Patagonia Houdini – Fits easily in my daypack, great for light rain and cold bus rides! Thermal Jacket – Montbell Thermawrap – For really cold nights. Hat – One baseball cap to keep the sun off my face. Sandals – Luna Oso – I live in these things…seriously. Not even sure why I carry socks. Running Shoes – Brooks Cascadia – My go-to shoe since hiking the Appalachian Trail. Nice Shoes – Sanuk – About as classy as a homeless hippie digital nomad gets. Guide Books – Lonely Planet – I didn’t start out with guide books, but another traveler gifted them to me and I use them a lot! Toiletries – Toothbrush, toothpaste, floss, sunscreen, shampoo, bar soap, electric razor, nail clippers, etc. Medical Kit – Very minimal…Band-Aids, Pepto-Bismol, Ibuprofen, etc. Not much though, you can buy all this stuff here too. Water Bottle – Vapur Element – Best. Water. Bottle. Ever. And that’s it! At no point have I needed anything else. On the contrary, several times I’ve wished I had left a few things at home. Mainly, the backpack rain cover and my Montbell thermal jacket. I considered bringing my eno DoubleNest hammock, but I’m glad I didn’t…Ecuadorians love hammocks so it’s been easy to find one to relax in. In the future I plan to travel with even less. 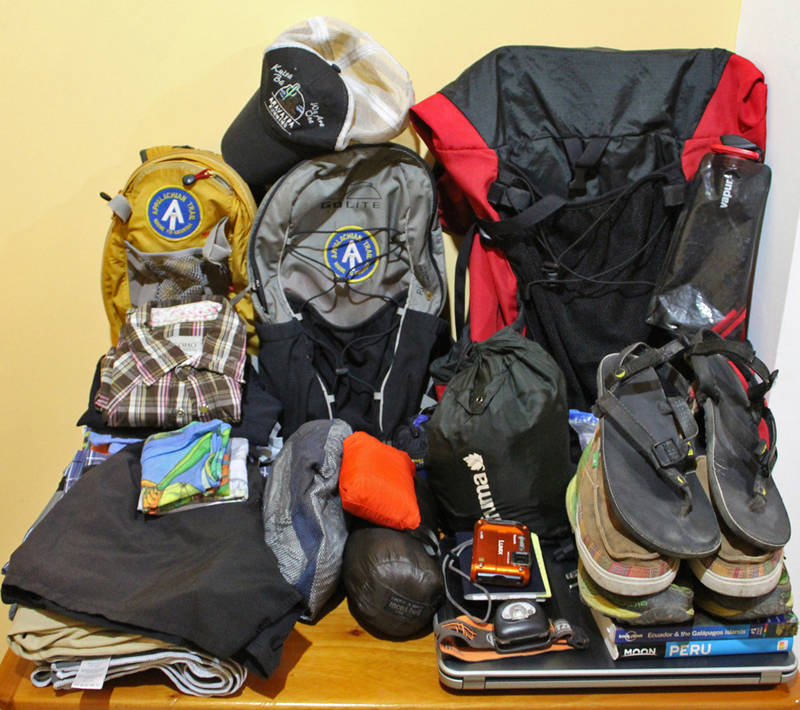 I’ll probably find a smaller backpack, a lighter daypack, a more mobile laptop computer, and pack one or two less t-shirts and pairs of socks. Ultimately, what I’ve learned through hiking the Appalachian Trail, living fulltime in a van, and backpack vagabonding in South America is that lighter is better. If you can learn to live with less, you’ll be able to enjoy more. Pingback:Here’s a Blog-site I Like – William Kemsley Jr.